This is a small tree or large shrub with deciduous, simple leaves. 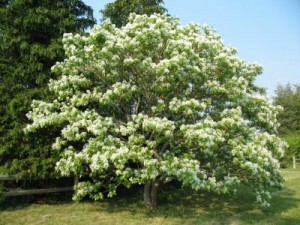 It has a short trunk and is often multistemmed, with a long, slender crown of stout, ascending branches. Bark is light gray to brown with reddish scales. Fringetree is one of the last trees to leaf out in spring. Leaves are very large, elliptic and untoothed. Fall leaf color is a fine, clear yellow, which serves as a nice contrast with viburnums and evergreens. The striking, drooping, white flower clusters emerge soon after the leaves, and are very fragrant. It thrives in moist rich stream valleys, slopes, and in hardwood forests. Fringetree is a native southeastern species, first cultivated in 1736, and has since been widely planted beyond its natural range. It is extensively planted in southeastern gardens. It prefers moist soil and a sheltered situation. Traditionally, the dried roots and bark were used by Native Americans to treat skin inflammation, and the crushed bark was used as treatment on sores and wounds.